Home » Uncategorized » BOND PRIMER: What is the difference between bond yield, bond interest, and bond price? « BOND PRIMER: What is an inverted yield curve and what does it mean? 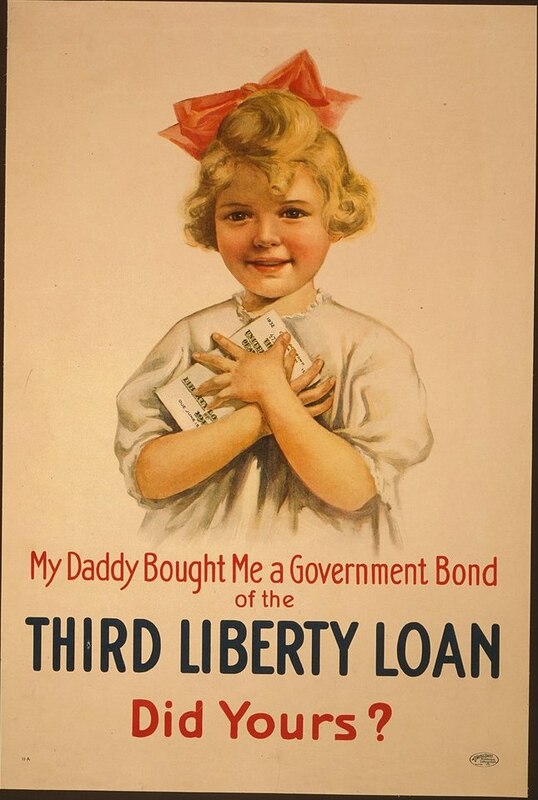 As a short explanation, US bonds (or other kinds of US treasuries) work like this: The US Treasury sets a face value (guaranteed redemption value upon maturity) on the bonds it sells along with a fixed interest rate (called the coupon rate because bonds used to be issued on paper and came with attached coupons that could be redeemed from a dealer for the interest as their date arrived). The coupon rate or coupon interest gets paid to the bond holder periodically until maturity. If a bond sells for its face value this is called selling for par value. 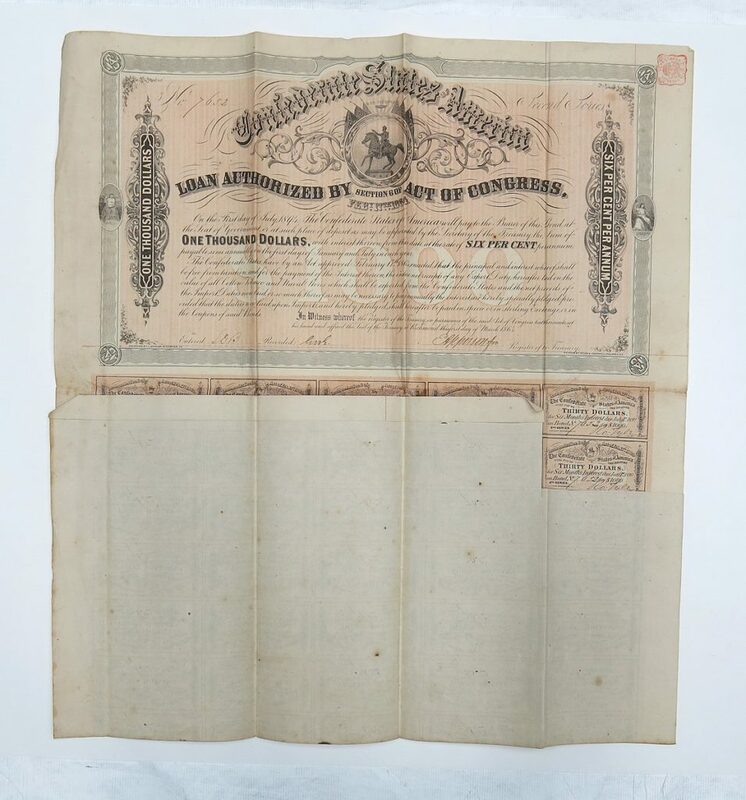 $1,000 US bond, stating coupon interest with some coupons still attached at bottom. 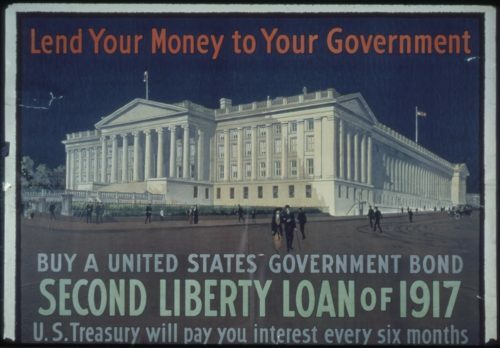 The treasury then auctions those bonds off to primary dealers (large banks approved by the US Department of the Treasury because they can handle buying and selling enormous volumes of bonds), and the auction determines the actual price the dealers pay the government for each bond versus the face value. The dealers that bids the highest price gets the first takedown of as many bonds as it wants at that price. Then the dealer that bid the next lowest price, and so forth until all the bonds the government wanted to issue at that auction are taken. Obviously, dealers intend to bid less than face value so they can feel assured of being able to sell each bond for more than they paid for each bond. The government, of course, would like to sell the bonds as close face value as it can so it doesn’t have to pay back more than it borrowed via the bonds in addition to the coupon interest that it will certainly be paying. The primary dealers then resell those bonds on the secondary market to institutional investors, such as pension funds, insurance companies, and retirement mutual funds. The difference between what the primary dealer paid at auction for each bond and the face value or whatever price the bond sells at in the secondary market, is the dealer’s profit (because the dealer doesn’t intend to hold any of the bonds long enough to collect the coupon interest). Thus, the price of a bond may change every time it is sold; whereas its face value always remains the same. The bond yield on any treasury instrument (in simple terms) is what an investor will make off of the coupon rate PLUS what he or she will make or lose on the price he or she paid for that instrument (a capital gain or loss) when the government redeems the bond at face value. If you buy a 5-year government bond with a face value of $1,000 for $950, and you plan to hold it until maturity, you will profit from a guaranteed capital gain of $50 at the end of five years when the government redeems the bond at face value. So, if you buy and hold, you know exactly what your bond yield will be. Here is how you calculate that in simple terms: Since that is a gain of $10 per year on your $950, that $10 comes 1.053% interest per year on your $950 (to get percentage, you divide 10 by 950 and then multiple by 100). That’s just the annual yield from your guaranteed gain on the $950 price you paid for the $1,000 bond. In addition to that, you will get the stated coupon interest the government promised on the bond, which will be sent to you on a regular (typically semi-annual) basis. The combination of the gain you made on the price (expressed as an annualized percentage rate of return) and the coupon interest becomes the actual bond yield — its total annualized return to the investor. Thus, if the coupon rate was 5% annually, the bond’s yield in this example would be 6.053%. The coupon interest rate is fixed, but buyers may pay less than the face value (a discount) to buy the bond because they want to make sure that, when the government redeems the bond at maturity, they make some money off of it. As demand (competition) rises for a particular treasury bond issue (a set number of bonds), the price bidders will have to pay for the bond rises for simple supply-and-demand reasons. It can even go above face value (a premium). Thus, the yield of a bond changes over time, depending on when you sell it, if you sell it as an always tradable asset. Yields can also go up over time because the government suddenly decides to issue a lot more new bonds. It’s a fundamental law of economics that, if supply goes up while demand remains the same, the price goes down on new government bonds because they are suddenly more plentiful than buyers were at the pervious price. Since buyers don’t have to compete as hard for them, they don’t bid the price up as much. The price paid on new issues may also go down for a bond with the same face value (redemption value) if the government decides to offer lower interest on the bond’s coupon. In which case the government loses more when it eventually redeems the bond at full face value, but it loses less each year on the interest it pays out. It’s up to the government to weigh that out when it determines what interest to offer on the coupon rate. When the price of those new government issues goes down, for whatever reason, then the price of any outstanding older bonds also goes down because everyone is going to buy the new bond with the higher yield (lower price or better coupon rate) until holders of the old bonds who want to sell drop their price to where the total yield remains the same as what investors can get on the new bond issues. Bonds have prices so they can be readily bought and sold as assets. If you trade bonds, rather than buying them and just holding them until maturity, you are mostly betting on whether prices will rise and fall because the interest on the bond coupon remains the same. Big institutions and government may even use the bonds they own like money, moving it based on its current price to another institution as payment for something. Now that is typically done on computer, but bonds used to be issued as physical certificates that be be exchanged like dollar bills, or you could just pay someone by giving them your bond coupons, which worked nicely for tax evasion as you realize no income from the coupon then, especially if you are using it to buy something you can’t declare as a business expense. Thus, bearer bonds (where the coupon interest is paid to anyone who bears the coupon because no one is named on the coupon) are often seen as being almost as liquid as cash. US bearer bond coupon, almost as good as cash. This easy tradability is why investors who own a lot of bonds who are looking to make money off the capital gains from the bonds, rather than by holding them full term and collecting interest, hope that yields on new bonds fall. That will make the guaranteed coupon rate on their existing bonds look more attractive so buyers will pay a higher price for the bond than what the investor initially paid. What happens if people pay a premium to get a bond, say you pay $1020 for a $1000 bond. Why would they do that when they’re going to get back $20 less from the government than what they paid for the bond. The answer would be the coupon interest. The interest must be attractive enough on the front end years that the investor doesn’t mind the eventual slight loss when the bond is redeemed over the total he originally paid to get it. If you subtract the capital loss when the bond is redeemed from the coupon interest you made in order to know your true bond yield it apparently still pencils out to make sense to investors. So-called “negative interest” can actually happen when people pay a price for the bond that is so high above its face value that, even after all their coupon interest is added to what they get back at maturity, they wind up with less money than they originally paid for the bond, so they are effectively getting negative interest. Why would investors buy a bond, knowing that it will effectively pencil out with a negative interest rate over the years that they hold? In rare instances when investors become so afraid of what the future holds that they will accept a small assured loss on a government bond that is seen as the safest investment available to them over greater the risks of loss they perceive on all other investment options (including stock, real estate, etc.). If they remain certain their national government will not default or will be the very last entity on earth to default, they may accept a small known loss as an insurance price on their money over risking all their money in an everything-goes whirlwind of a financial collapse. We saw this on government bonds in some countries during the Great Recession. People may also be willing to pay more than face value (a premium) on an old bond because the government has moved to such low interest on new bonds of the same face value or because of high demand. Thus, a bond with a high coupon interest rate is more likely to hold its price better or even exceed its face value in price than a similar bond with a lower coupon interest rate. Please let me know in the comments if some aspects of this could have been expressed more accurately, while remaining equally simple, and I’ll make the adjustments; but the goal here is a clear simple picture, not an accurate capturing of every nuance in bond trading.